Sparkling Clean has been removing Minneapolis MN ice dams with steam for over 10 years! Our low pressure steam equipment was designed specifically for safe and gentle ice dam removal. Our steaming process will not damage your roof as other methods of ice dam removal such as pressure washers and hammers. 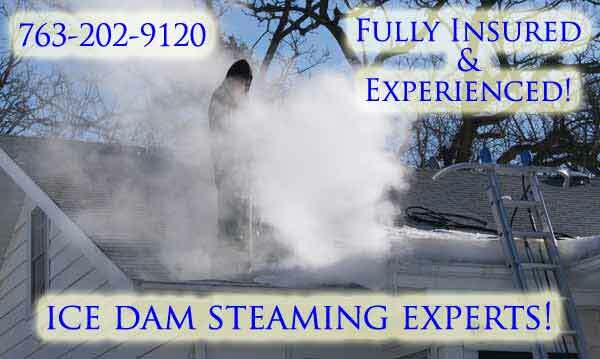 We are fully insured for ice dam steaming in Minneapolis MN. Often times we can deal directly with your insurance company to minimize your cost for ice dam removal. Minneapolis is no stranger to ice dams on roofs and insurance companies are very much aware that low pressure steam is the safest way to remove ice dams from roofs with no damage. If you are considering hiring a company for ice dam removal in MNPLS please make sure the equipment is low pressure steam and not a high psi hot pressure washer. Make sure the equipment does not have a trigger on the gun like a pressure washer. A low pressure steamer will not have a trigger on the gun. We remove ice dams with steam in Minneapolis MN from residential and commercial roofs. If you would like to hire us for your Minneapolis MN ice dam removal needs please give us a call 763-202-9120 or Contact us here. We answer 24/7 during the ice dam removal season.